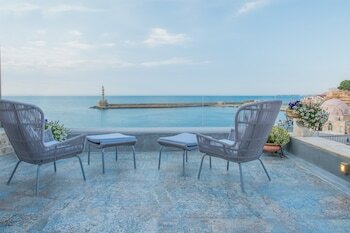 With a stay at Residenza Vranas in Chania (Chania Town), you'll be a 4-minute walk from Chania Lighthouse and 6 minutes by foot from Venetian Port. Featured amenities include complimentary wired Internet access, limo/town car service, and express check-in. For a surcharge, guests may use a roundtrip airport shuttle (available 24 hours) and a train station pick-up service. When you stay at Billy's Studios in Rhodes, you'll be near the beach and 8 minutes by foot from Faliraki Beach. The front desk is staffed during limited hours. Free self parking is available onsite. When you stay at White Tinos Luxury Suites in Tinos, you'll be 6 minutes by car from Kechrovouni Monastery. Free self parking is available onsite. When you stay at this villa in Lavreotiki, you'll be by the sea and 9 minutes by car from Port of Lavrio. Free self parking is available onsite.